Integrity. Respect for others. Commitment to excellence. 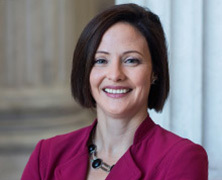 Before joining New York Life in 2006 as assistant vice president for legislative affairs, she worked as trade counsel for the Ways and Means Committee of the U.S. House of Representatives, advising Members of Congress on international trade negotiations and other legislative and regulatory trade issues.